There are few things in life that will scare an amateur baker on a televised baking competition. One is the Paul Hollywood blue-eyed stare. And the other, is a soufflé. The soufflé is said to be one of the most difficult things you can make, but if you think you’re up to the challenge (and we absolutely think you are!) then get involved by joining the ultimate Bake Off bake along! Unlike our judges, we’ve provided a full recipe below and we won’t be timing you, so you can get it just right! Simply whip up a treat, take a photo and upload it right here. In the comforting words of Mel and Sue: On your marks, get set, BAKE! 1. Preheat the oven to 190C/ fan 170C/ gas 5 and place a heavy baking sheet on the middle shelf of the oven. 2. Grease a 14cm x 8cm (1.2 litre) souffle dish with butter and dust with caster sugar. Add a 7.5cm collar of parchment paper folded at least 4 times and secured with string. 3. For the crème pâtissière chocolat, melt the chocolate in a bowl set over a pan of simmering water. Remove from the heat and leave to cool slightly. 4. Pour the milk and cocoa powder into a heavy-based pan and bring gradually to the boil. Remove from the heat and leave to cool for 30 seconds. Meanwhile, in a medium bowl, whisk together the egg yolks and caster sugar until pale, then whisk in the plain flour. Pour the chocolate milk onto the eggs, whisking continuously, then pour back into the pan. 5. Bring back to the boil, whisking continuously over a medium heat and cook for 1 minute until thickened. Remove from the heat and whisk in the melted chocolate. 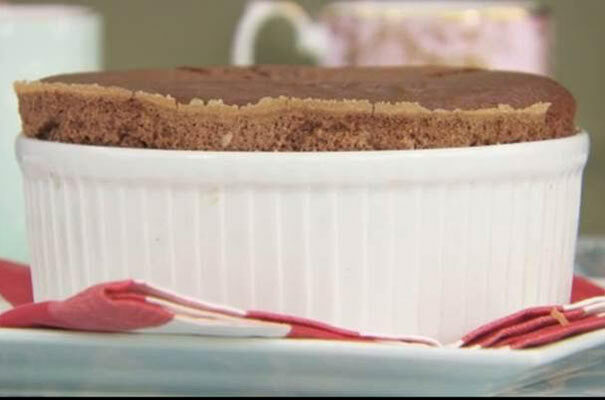 Spoon the crème pâtissière chocolat into a bowl, cover the surface with cling film to prevent a skin forming and leave to cool to room temperature. 6. In a clean bowl whisk the egg whites to soft peaks. Add the sugar and continue whisking to a stiff and glossy meringue. 7. Whisk one third of the meringue mixture into the crème patissiere chocolat, then fold in the reaming three quarters with a large metal spoon. The mixture should be fairly loose. 8. Pour the mixture into the souffle dish. Run your thumb around the interior rim of the dish, to ensure a good rise and bake on the baking sheet in the preheated oven for 40-50 minutes until well risen and springy to touch. 9. Take a photo and share your bake with the nation.